Washington Redskins wide receiver Pierre Garcon is suing FanDuel for misuse of his name and likeness. He is seeking class action status on behalf of NFL players similarly situated. Professional athletes’ names and likenesses are valuable intangible property. Indeed, Plaintiff’s and Class members’ continued popularity and successful performance on the field are critical to their own commercial success and the commercial success of the NFL. Plaintiff, and upon information the other NFL players, have not consented,in writing or otherwise, to Defendant FanDuel’s use of their names or likenesses to promote or to operate its daily fantasy sports product. OK. I get it. Yes, NFL players should be compensated for the use of their names and likenesses. And FanDuel should pony up. That’s right — the NFL Players Association has a contract with DraftKings and receives compensation for the use of player’s names and likenesses. I don’t have the details of what that compensation schedule looks like, but that’s not my point here. My point here is that this contract indicates to me that the NFL Players Association endorses fantasy sports in general. If the NFL Players Association objected to fantasy sports, they’d not have entered into this contract. And Garcon’s lawsuit would look very different and have very different claims — if it were to have been filed at all. If you’d like to check out fantasy sport for yourself, you can go to FanDuel, DraftKings, and DraftDay. All have various promotions for new players. It was only a matter of time before some states challenged the UIGEA exemption for daily fantasy sports sites like DraftKings, DraftDay, and FanDuel. Starting with Nevada — which has told daily fantasy sports (DFS) operators to cease operating within their state without a gambling license — other states are now taking a much closer look at DFS. One of the key issues is that DFS operators use gambling and betting related vocabulary when speaking about their site to anyone other than law enforcement. Another issue is the sniff test — it sure smells like gambling to anyone that cares to take a whiff. But let’s take another look at this. It takes skill and analysis to determine the most probable profitable players to draft each week. You think that Manning will earn the most points this week? Who cares! The real question is which players — as a group — will earn the most points PER SALARY DOLLAR SPENT on drafting that player that week. Gambling or not — DFS does make for a much more interesting sports watching experience. Finding video poker games with the highest paytables at land-based casinos can be difficult. There are usually just a few of machines that have the “full-pay”, or best-you-can-expect-to-find, paytables. They are often hidden away in the back corners of the casino. They are often moved around from time to time so you have to hunt for them each time you go to the casino. 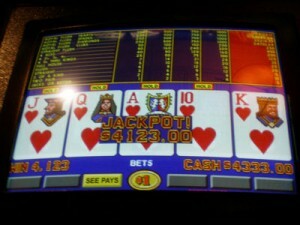 Finding video poker games at online casinos with the highest paytables is a snap. Why? Because I have do it for you! Here is the list of the top video poker games and their payback percentages that you will find at online casinos. All three of these sites are US-friendly, and have 5-star ratings at The Online Casino Gambling Directory. In my last blog post, I provided an update to the video poker paytables for 19 video poker games found at online casinos. In this blog post, I’ve summarized the easiest way to get complete coverage of the best paytables for these video poker games. Step 1. Open accounts at these six online casinos. All are US-friendly and are 5-star rated by The Online Casino Gambling Directory. Step 2. Use the table below to determine where to play each video poker game. For example, Joker Poker video poker should be played at Bovada, Deuces Wild video poker should be played at Bingo Fest, while Jacks or Better video poker can be played at any of Slots of Vegas, Bovada, or Treasure Mile. Do you love video poker? I know I do. In fact, I’m kind of obsessed with it, and am always looking for any edge I can get against the online video poker machines. I’ve just completed updating my online video poker page to include the current paytables for 19 video poker games that are common at online casinos. In addition, I have made it much easier to see which online casino offers the lowest house edge / highest player return for each video poker game. 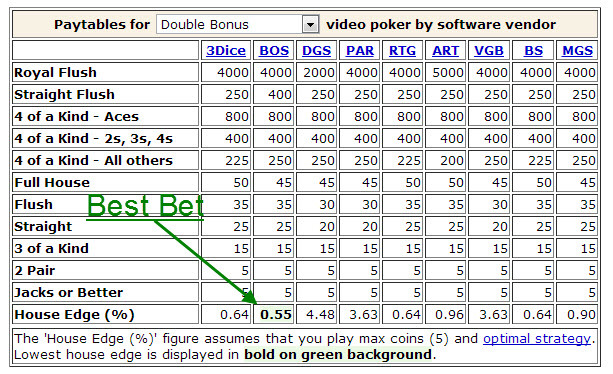 As shown in the image below, your best bet is highlighted in bold font on a light green background. Here are links to the paytables for the 19 video poker games that are most common at online casinos. One of the first things that video poker players learn is to pay attention to the pay table for the video poker game that they are playing. In the long run, the difference between a 9/6 and an 8/5 Jacks or Better machine is enormous. Just like when playing video poker in a land-based casino, online video poker players should shop around and compare pay tables at various online casinos. This is a time-consuming process — I know because I have done it for three popular video poker games: Jacks or Better (JoB), Deuces Wild (DW) and Double Double Bonus (DDB). What makes the comparison even more difficult is that not all online casino operators that run on the same platform (e.g. Real Time Gaming, Rival, BetOnSoft, etc.) have the same paytables, as operators are typically allowed to use whatever paytables they wish. So, you can’t look at just one online casino on each platform — you have to hunt for the best online casino on each platform. Here is the expected return percentages for three popular video pokers, single handed, assuming optimal play and maximum coins in. For each variety of video poker, a green cell indicates the highest available return, yellow indicates a reasonable return, and red indicates a poor return. It looks like the top three are pretty close, with Treasure Mile holding a slight edge over Slots Plus and Bovada. But look what happens when you compare the same games in their multi-hand varieties. Treasure Mile offers the same return on its multi-hand video pokers as it does on its single hand video pokers, giving it the clear edge over Slots Plus and Bovada. Beyond paytables, other factors may be important to consider, depending on your preferences and style of play. Keyboard shortcuts: Only Treasure Mile offers complete keyboard shortcuts (1-5 to toggle cards, spacebar to deal). Auto-hold winning hands on the deal: It’s curious to me that none of the top three sites in the table above offer this feature, while all of the bottom seven sites offer this feature. Denominations: For single-handed video poker, Treasure Mile has limits from a penny to $5; for Slots Plus and Bovada, the limits are a nickle to $5. All sites on the list have lower limits for multi-hand video poker, typically from 0.01 to 1.00. Overall, Treasure Mile is the best choice for online video poker. A note for beginners: You might want to look at 3Dice; their game selection is lacking, but their odds are top of the line on Jacks or Better, which is what you should play when just starting out. What 3Dice has that you might like is auto-selection of winning hands after the deal AND very good suggestions for which cards to hold after the deal if you are not dealt a winner. Their auto-suggestion engine does a good job in matching optimal strategy: for example, it offers to hold 4-straights and 4-flushes over low pairs, and only the lowest two high cards when dealt more than two unsuited high cards. Three Card Poker (also called Tri-Card Poker) is a popular table game at many casinos. Most casinos, both online casinos and land-based casinos, have reasonable pay tables for winning hands. However, as with most casino games, it pays to shop around for the absolute best returns that you can find. As I recently blogged, NuWorks is a new online casino software vendor. It is being used by only a few sites, one of which is US-friendly BuzzLuck Online Casino. Their Jacks or Better video poker is the best. They have a full-pay paytable with a return of 99.54%. You won’t find a better Jacks or Better video poker paytable anywhere, either online or in land-based casinos. The Deuces Wild returns 98.91%. This is decent, and matches the best return that you can find at any online casino that accepts US players. You can skip their Joker Poker video poker with its 98.40% return. BoDog rocks Joker Poker with its incredible 99.97% payback. Add more video poker varieties. Double Double Bonus comes to mind. Support keyboard shortcuts for card selection a dealing. Provide a way to turn off the double-or-nothing screen that annoyingly appears after each win.